“The man o' independent mind – he looks and laughs at aa that”. The genius of Scotland's immortal bard has appealed to many folks for many different reasons. He had an exceptional ability to deeply understand humanity and to express his observations through his advanced skills in verbal and written communication. He was able to reach people from a wide range of social, political, religious and philosophical backgrounds. Hardly surprising then that people with contrasting views and ethics seek to embrace him as one of their own. I'm afraid I'm no different. I will stick my neck out and say with absolute conviction that if Mr Burns was alive today that he would be no devotee of the EU and would have voted to escape from the control of that regime in the 2016 EU Referendum. There. I said it. And I await,in eager anticipation, an onslaught of challenge and abuse from an assortment of pro-EU Establishment academics and other non-academic EU devotees. Where to begin my explanation for such a claim? Best to look at what the Leave vote of 2016 was all about. It was primarily about sovereignty, democracy and liberty. All other aspects of the Leave vote: economy, trade, patriotism, immigration etc were related to, but secondary to, the desire for sovereignty, democracy and liberty. These values and aspirations were also at the very core of what ignited the poetic fire of the 18th Century bard. Burns was a patriot: a Scottish and a British patriot: but not at any cost, and just as important, he was an internationalist who advocated for the Rights of Man, and the Rights of Woman, the world o'er. He had supported the ideals of the French and American Revolutions of his lifetime where he challenged regimes of those nations that restricted the democratic rights, sovereignty and liberty of the people. His 'Ode for General Washington's Birthday', 'Tree of Liberty', 'A Man's A Man' and his 'Rights of Woman' are among his finest works that demonstrate his cosmopolitan outlook and his advocating for universal liberty. If alive today Burns, I believe, he would deeply distrust an undemocratic European Union as it endeavours to become an authoritarian superstate: a wee insular political enclave that would jar with his worldview. He certainly would not have wanted Scotland and the rest of the United Kingdom to be part of it. Instead he would have championed the cause of the people of Europe, as well as the people of Britain, in their quest for democracy, sovereignty and liberty. He would,no doubt, have addressed today's 'Rigidly Righteous and the Unco Guid': those who are campaigning for a so-called 'People's Vote' - those political elites who call for a 2nd referendum before the result of the 1st referendum has been implemented: just because they didn't like the result of the first one. Rabbie was very much into respecting the rights of “The People” and fervently challenged and ridiculed those who didn't. This issue would have exercised him more than the referendum vote itself. His logical thinking would have despaired at this assault on democracy, liberty and the “Rights of Man”. The current situation would compare with the French and American Revolutions of his lifetime where "the People" challenged the ruling political elites and their abuse of power. Only this time round there would be the added twist that it would now be the elite political establishment of his own country abusing their power over the people of his own country. “ While we sing God Save the King we'll ne'r forget The People. These virtue signalling elitists would have been the “rigidly righteous Holy Willie's” of his era. Some of his most celebrated 18th Century works were inspired by such issues. They would also have represented the political elite of his time whom he addressed with such lines as: “ Ye see yon birkie ca'd a lord wha struts an stares and aa that - tho hunners worship at his word, he's but a cuif for aa that. The man o independent mind, he looks and laughs at aa that”. Those who do not understand Burns think he was inconsistent in his values: a mere opportunist in pursuit of personal monetary gain. Nothing could be further from the truth. He was faithful and loyal to his kirk and state: but not at any cost. He was a Presbyterian who challenged the hypocrisy of elements of the hierarchy of the kirk. He was a democrat who supported the rule of law and the authority of the democratically elected government while openly challenging aspects of the system. He did not blindly bow in devotion to the establishment: he queried and challenged the status quo. He had a keen interest in the politics of his time but was not a member of a political party. In Burns' time some people could just not understand that he was an independent free-thinker who was genuinely open-minded and that his support for any cause came with conditions..
His assault on the Scottish elite who he reckoned were bought and sold for English gold in in the early 18th Century would surely have been directed at the Scottish, British and Irish political elites of the early 21st Century who are being bought and sold for Brussels gold. In January 2019 people from a wide range of backgrounds will gather across the world to celebrate the bard: the man and his works. They will include loyalists, republicans, monarchists, Jacobites, Williamites, nationalists, internationalists, unionists, liberals, democrats, conservatives, communists, socialists, capitalists, Presbyterians, humanitarians, Freemasons, farmers, civil servants, entrepreneurs, soldiers and peace makers. They will each focus on what Rabbie Burns means to them. And that is all good because Burns did have the uncanny ability to connect with all those types of people on some level. It is difficult for many to get their heads around this and at the same time understand that he was a man of clarity who steadfastly stood for his principles. What is interesting about all of those types of people, listed above, is that among their kind their were many who would have voted Leave in the EU Referendum of 2016, as well as many who voted Remain. So no conflict here in my rationale that a Rabbie Burns in 2019 would be a fervent supporter of democracy: demanding that the democratic will of the people should be respected. Burns was also NOT many things. He was a not a sycophant who could be “bought and sold for English gold” (or Brussels or Berlin gold ) and while he was “naebody's lord” he would be “slave tae naebody”. He was a “man o independent mind who looks and laughs at aa that”. 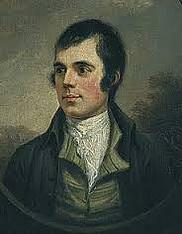 On January 25th 2019 I will slowly sip and savour every precious droplet of a wee dram in memory of the immortal bard for his 260th birthday. On March 29th 2019, assuming we do get to Leave the EU for real, I will slowly sip and savour each precious droplet of another wee dram and cheer the spirit of Robert Burns once again.